There's only one thing worse than an iPhone with a low battery — and that's an iPhone whose battery is draining too fast for no reason you can figure out. Not only does an iPhone in that situation not work for as long as you need it to, potentially leaving you without a way to contact people or enjoy music and apps, but there's also no obvious way to solve the problem. Many users have reported that iOS 11 drains the battery on their iPhones faster than normal. If you're facing this problem, you've come to the right place. Read on to learn more about iOS 11 battery issues and 10 different ways to solve them. What Causes iOS 11 Battery Drain? You're already frustrated by these mysterious iOS 11 battery issues and you want answers. I'm sorry to say, though, that there's no simple, single explanation for what's going on with your iPhone's battery. A lot of things can cause a battery to run down faster than expected. It's usually the result of a bug in either the iOS or in one of your apps, but not always. Sometimes there could be settings in place on your phone that cause the battery issues, too. There are dozens, probably hundreds, of potential causes. That said, these 10 tips address some of the most common culprits and how to solve them. The tips in this article apply to any device that can run iOS 11: the iPhone, from iPhone 5S and up; the iPad, from iPad mini 2, 5th generation iPad, and up; the 6th generation iPod touch. If iOS 11 is the source of your problem, ditch iOS 11 by upgrading to the latest version your phone can run. All new versions of the iOS are free, and Apple releases them multiple times a year, so you should have options pretty regularly. When you're going to upgrade, you just need to decide if you want to do it wirelessly or using iTunes. Need to upgrade your iPhone operating system, but getting an error saying you don't have enough free space to do it? Solve that problem with the tips in How to Update iPhone When You Don't Have Enough Room. Apple knows that people care about getting the best battery life from their phones, so it built tools into the iOS to let you know what's sucking up the most power. Go to Settings > Battery and check out what apps and features are using the most power over the last 24 hours and the last 7-10 days. Uninstall apps that are using the most juice. Just like bugs in the operating system may cause iPhone battery problems, bugs in the apps installed on your phone can have the same effect. Those sorts of bugs often get solved when developers release new versions of their apps. Update all of your apps to the latest version by going to the App Store app > Updates and you may fix the issue. After the controversy about Apple "throttling" the speed of users' phones to prolong battery life, the company added a Battery Health feature to the iOS that lets you know how healthy your battery is. Find it in Settings > Battery > Battery Health. That screen will let you know if your battery is in good shape and, on some models, will let you change settings to adjust phone speed and battery life. The iOS learns your habits — like when you like to check email or social media, for instance — and then updates your apps in the background so that they always have the latest information waiting for you. This is smart, but it also can contribute to iOS 11 battery issues. Disable these features to conserve power by going to Settings > General > Background App Refresh > Background App Refresh > Off. Another instance in which your iPhone trying to do something smart behind the scenes can drain battery is checking email. If your iPhone is set to "push" email from the server any time new messages show up, your battery can run down fast. Set your Mail app to "fetch" email periodically instead. Go to Settings > Passwords & Accounts > Fetch New Data > choose Manually, Hourly, Every 30 Minutes, or Every 15 Minutes. iOS 11 battery issues are almost always caused by software problems and, believe it or not, a lot of software problems can be solved by a simple restart. Restarting your phone also restarts its software. It's quick and easy, so it's worth a try. If nothing has worked so far and your battery is still draining faster than it should, it's time to try a more drastic step. Restoring your iPhone to factory settings takes it back to the state it was in when you first took it out of the box. This is a good way to try to correct any software problems that you haven't been able to fix yet. Restoring to factory settings means you'll delete everything from your iPhone. Make absolutely sure you've got a good backup before you do this to make sure you don't lose any precious data. As mentioned earlier, there are dozens and dozens of things that could cause your iPhone battery to drain faster than you expect. 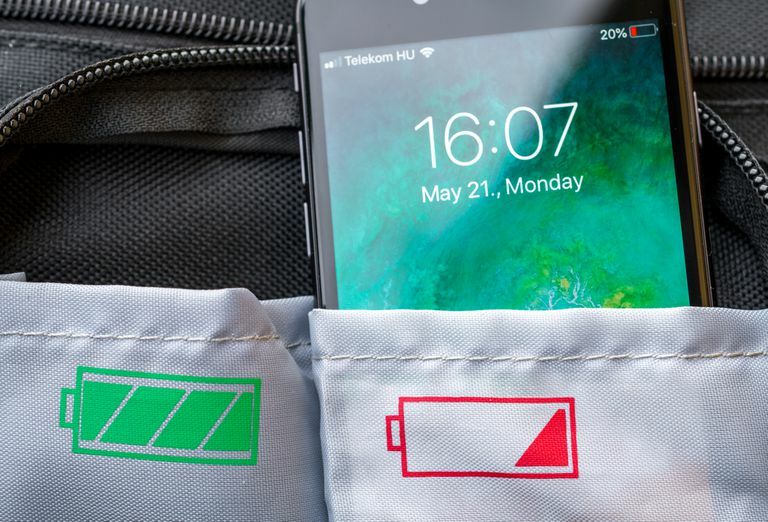 We can't list them all in this article, but we do have an article with 30 tips on how to get more life from your iPhone battery. Check it out for some more ideas. Still running into battery problems even after all this? The problem might be the hardware in your iPhone, not the software. The best way to figure that out is to get support from Apple to determine whether there's a hardware problem and, if so, how to fix it. Learn how in How to Make an Apple Genius Bar Appointment for Tech Support. If it turns out you just use your iPhone a lot, consider getting an external battery to make sure you never run out of power.